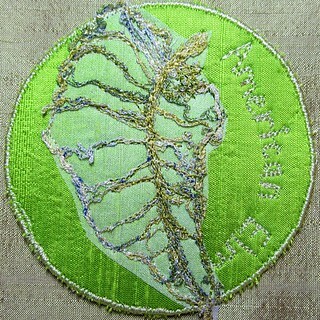 Another leaf on soluble stabilizer, this one stitched to silk organza and then stitched to the circle. This is an elm leaf. I keep tabs on a set of elms, just because I think someone has to. There is one outside a convenience store at the corner of Old South St (this leaf is from that tree), and two along the north side of Rt 9 through Smith college. Two of my favorites arc over Amity St. in Amherst, on the way down the hill towards home. I am having some trouble posting things through typepad. They are working with me to fix my problems, and it will get squared away soon.